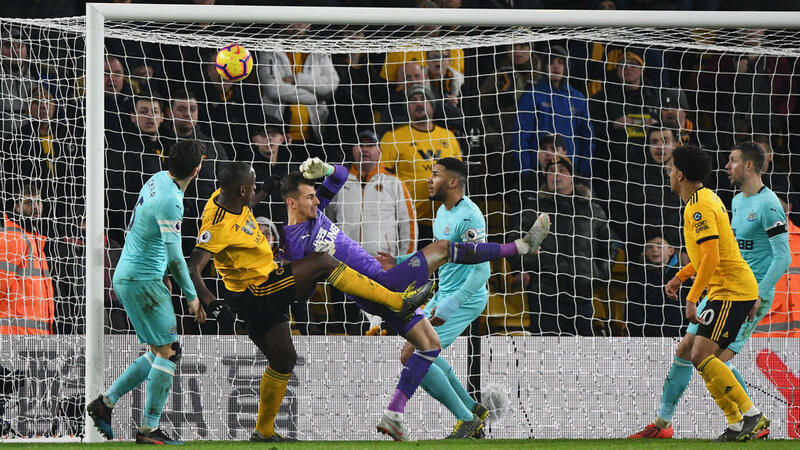 Newcastle goalkeeper Martin Dubravka damaged his side's bid to avoid relegation for the second successive match as his late howler gifted Wolves a 1-1 draw on Monday. Rafael Benitez's side were seconds away from a valuable victory after Isaac Hayden's first goal since 2017 put them ahead in the second half at Molineux. Hayden's goal had come via a weak attempted save from Wolves keeper Rui Patricio. But it was Dubravka's clanger at the other end that stole the headlines when the Slovakian allowed a cross to slip through his grasp as Willy Boly headed home deep into stoppage-time. Dubravka will be public enemy No.1 on Tyneside after his latest gaffe, which came just days after he let Son Heung-min's shot squirm through his legs to give Tottenham a late winner. Back from a warm-weather break for a training camp in Marbella, seventh placed Wolves looked like they were still on the beach when Newcastle's Salomon Rondon was granted too much space for a low shot away that forced Patricio into action. Sprawling to keep out Jonny's effort soon after, Dubravka was doing his best to redeem himself after his mistake against Tottenham. Wolves tried to mount an immediate response and Diogo Jota's low strike was well saved by Dubravka, who also kept out Leander Dendoncker's header soon after. And it seemed Wolves' pressure would be in vain, until Dubravka ended up as the villain yet again in the 95th minute. Adama Traore's high cross hung in the air for an age, but Dubravka reacted hesitantly, allowing the ball to fall through his arms and hit Boly in the face before rolling into the net for a farcical equaliser.